The tomb of Ezekiel contained 66 marble plates. Ancient Hebrew letters reveal the entire book of Ezekiel in raised letters on what was the back side of the plates that covered the interior of the tomb. Could they date to the time of Ezekiel? Tests are being done to determine just that. Some years ago the tomb of the prophet Ezekiel was found next to the Euphrates River in ancient Babylon (modern Iraq). 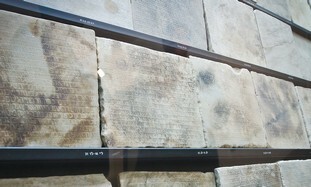 Part of the tomb was covered with 66 12-inch square marble plates. 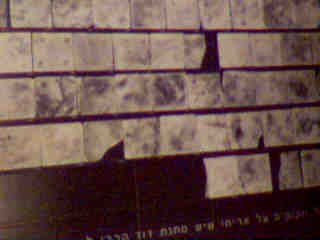 When the squares were removed the entire book of Ezekiel was found in raised letters on the back of the plates. Today the plates are housed in the Yad Ben-Zvi Institute in Jerusalem. The 66 plates contain the complete book of Ezekiel almost exactly as found in our modern Bibles today. At present, two of the plates are being tested by the Israel Museum for authenticity. and gather you out of all countries, and will bring you into your own land. filthiness and from all your idols, will I cleanse you. will take away the stony heart out of your flesh, and I will give you an heart of flesh. ye shall keep my judgments, and do them. Although the interpretation of this regathering refers to the final regathering of Israel after the Battle of Armageddon, there is little doubt that Israel’s birth as a nation on May 15, 1948 is also in view here. neither shall they be divided into two kingdoms any more at all. Luke 1:31 And, behold, thou shalt conceive in they womb, and bring forth a son, and shalt call his name JESUS. ever: and my servant David shall be their prince for ever. multiply them, and will set my sanctuary in the midst of them for evermore. surrounding the nation Israel. The ten are listed as Persia (Lebanon, Jordan, Syria, Iraq, Iran, Saudi Arabia, Egypt) Ethiopia, Libya and Turkey (Ez. 38:5,6). At the present time, tiny Israel (about the size of New Jersey) is being pressured to give land to establish a Palestinian State. In exchange, Israel is to receive a promise of secure borders. According to Daniel 9:27, it is possible that once this Peace Treaty (Covenant) is signed, the seven-year-long Tribulation will begin. Daniel tells us that half way through the 7-year period, the Treaty will be broken. scourge shall pass through, then ye shall be trodden by it. safely, shalt thou not know it? sanctified in thee, O Gog, before their eyes. yourselves, and come; gather yourselves on every side to my sacrifice that I do sacrifice for you, even a great sacrifice upon the mountains of Israel, that ye may eat flesh, and drink blood. Chapters 40 through 48 conclude the book of Ezekiel with a description of Israel in the promised land during the Millennium. A detailed plan of the new Temple is given with the view of the glory of God once again filling the whole house. Each of the 12 tribes of Israel is given a description of the land they will occupy in the greatly expanded nation reaching from the River of Egypt to the Euphrates. According to the Jerusalem Post’s original announcement of the Ezekiel plates, “there is an old Talmudic tradition that Israel’s prophets and other great sages were often buried with copies of their writings. One such Talmudic legend held that the original book of Ezekiel was buried with the prophet in his tomb and was left there to be revealed in the last days.” We will say no more.